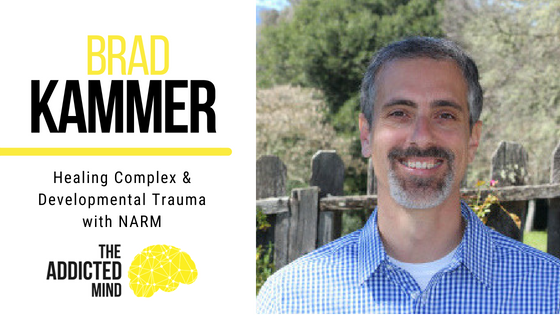 Our guest on this episode of The Addicted Mind podcast is Brad Kammer, a therapist specializing in somatic psychotherapy to solve shock and developmental traumas. Brad’s interest in somatic psychotherapy began during his time as an aid worker working with Burmese refugees. He observed their healing rituals, which frequently involved physical actions such as singing, chanting, or performing, and while he was going through his own healing process from the secondary PTSD from his time with the Burmese people, he realized that talking through trauma is not always effective. By working through the complex traumas experienced during childhood or other traumatic events with the body, healing can be much more attainable. Additionally, using more natural and realistic relationship-focused alternatives to the typical therapy session involving closed shades, a locked door, and no interruptions make people much more likely to share openly and get to the root of their traumas. Whether we realize it or not, our psychobiological patterns are established early on, and these patterns impact how we will cope with unfortunate circumstances and make decisions throughout adolescence and adulthood. These patterns are mainly formed by our attachment or bonding circumstances with our caregivers when we are children, and we often find that patterns we developed out of the necessity for survival as children are actually getting in our way as adults and keep us from experiencing true freedom and joy. Brad uses the NARM (NeuroAffective Relational Model) to help individuals process their emotions from the top down (from thoughts and identity to emotional and physical aspects) and the bottom up (from the body to the thoughts and behaviors). He finds that clients often experience excitement and fear as the notice that their patterns are changing; excitement for the freedom they have found along with fear regarding the change and the potential loss of attachment, even if their attachment figure is no longer living. Therapy is a process, so results do not begin overnight, but with consistency and intentionality, therapy can provide the opportunity to reorganize and transform your life.